This article will examine a dietitian’s role in a clinical dental setting, outline some lessons learned from patients, and discuss the increasing potential for oral health professionals to have a vital role in dietary health promotion. Most of the content is derived from personal work experience and the examples are unchanged from original patient accounts. In 1993, I was offered the position of Dietitian at the Sydney Dental Hospital (formerly the United Dental Hospital) in Sydney, Australia, where I have continued to enjoy working to the present day. At the time, a dietitian working with the dental profession was (and still is) a rarity and the scope of work for dietitians in this environment was unclear. Dietetic training programs focus on many aspects of nutrition in health and disease, but oral/dental health is often excluded or minimized.1Shah K,Hunter ML, Fairchild RM,Morgan MZ. A comparison of the nutritional knowledge of dental, dietetic and nutrition students. Br Dent J 2011;210:33-8.,2Position of the American Dietetic Association: Oral Health Nutr 2007;107(8): 1418-28.,3Touger-Decker R, Mobley C, et al. In: Nutrition and Oral Medicine, R Touger- Decker, DA Sirois, C. Mobley, eds. Humana Press, Upper Saddle River, NJ, p. 376, 2014. With no dietetic dental colleagues to confer with, my knowledge in this field of nutrition was gained mainly from the work of specialists such as A.J. Rugg-Gunn, Carole Palmer, and Riva Touger-Decker.3Touger-Decker R, Mobley C, et al. In: Nutrition and Oral Medicine, R Touger- Decker, DA Sirois, C. Mobley, eds. Humana Press, Upper Saddle River, NJ, p. 376, 2014.,4Rugg-Gunn AJ, Nunn J. Nutrition, Diet & Oral Health. Oxford University Press, 1999.,5Palmer CA. In: Diet and Nutrition in Oral Health 2nd Ed. Pearson Education, Inc., Upper Saddle River, NJ. I have also benefited from the work of Professor William Young, who highlighted the impact of xerostomia and dehydration on oral health and the potential for dental erosion to develop in otherwise healthy and fit young people.6Young WG. The oral medicine of tooth wear. Aust Dent J 2001;46(4):236-50.,7Young WG. Teeth Edge Erosion: Watch your Lifestyle; Case Studies and Treatment Plans for Patients facing Dental Erosion and Tooth Wear Erosion. Watch Pty Ltd 2003. It soon became clear that diet and oral health are intrinsically linked and that nutritional support for patients can be a valuable component of oral and general health care across a range of conditions. Shortly thereafter, an applied nutrition course was developed for dental and oral health students at the Faculty of Dentistry. Dietary assessments and modifications to help lower the risk of caries and erosion are complex, because they involve more than simply identifying high risk foods and drinks. Other aspects of diet, such as food texture, timing of food intake, frequency of eating and drinking, and the overall adequacy of a diet to support health also need to be considered. Who Needs Dietary Advice in a Dental Office? Need dietary advice both healthy and sound. Or those with more teeth heading that way. The price of prolonged bottle drinking is plain. Alarmed their decay rate has gone so high. Are causes for teeth eroding away. But acid and sugar make a lethal mix. To prevent their teeth from decay and wear. Whose teeth become the real loser! When all that’s left are gums and lips! In getting people off to a better start. As food is no fun when teeth are a rottin’! A 14-year-old girl with a preference for peach-flavored iced tea drinks 500 ml or more per day and prefers to sip this beverage between mealtimes. A 19-year-old university student has a habit of sucking breath mints throughout the day, believing (incorrectly) that they promote fresh breath. An adult patient with Sjögren’s syndrome drinks cola beverages to relieve oral dryness, yet while gardening (often in the heat of the day) drinks nothing. Sometimes high risk behaviors can be easily identified, such as the young man who drinks two liters of soft drink daily and undertakes minimal oral hygiene, or the very young child being put to bed with a feeding bottle. Misconceptions can also inadvertently lead to poor food choices that may include multiple cariogenic actions throughout the day, such as sweet breakfast cereals, chocolate bread spreads, chips, juices, sweets, and biscuits between meals. Learned from years of diet interviews and histories, it appears this type of diet is commonly consumed by young children attending the Pediatric Clinic at Sydney Dental Hospital. The parent who describes their child as having a very slow eating style, taking long periods to finish a meal, and holding food in his/her mouth. The adult on psychiatric medications who often wakes at night and eats sweets. The parent who adds a sticky processed fruit snack to his or her child’s lunchbox each day, mistakenly believing this is healthy. Specific insights have come from the accounts of many patients referred to me for dietary assessment and advice related to their oral health. Almost twenty years ago, a mostly edentulous patient presented for dietary advice, lamenting about his inability to enjoy crusty Italian bread and chunky beef massaman curry. His story remained symbolic because it reflected the food-related losses associated with a compromised dentition, and reinforced the value of good oral health on quality of life and well-being across the lifespan. When assessing a patient’s diet, it is important to refer to and be familiar with the most current government dietary guidelines as a reference point. In Australia, these guidelines may be found at https://www.eatforhealth.gov.au/. Guidelines vary from country to country and are routinely reviewed and updated. Specific high risk dietary behaviors, such as frequent snacking, erratic meal routines, and diets consisting mostly of processed foods must be considered. Another example includes individuals who rely too much on sugary beverages for their daily energy requirements, at the expense of nutritious food. The Chairside Advice Project (CAP) was initiated in our service with the aim of developing a standardized format to provide a brief intervention approach for addressing the risk factors relevant to dental caries. Two forms have been designed and successfully tested with dentists and oral health therapists, and will be launched in local dental clinics this year. 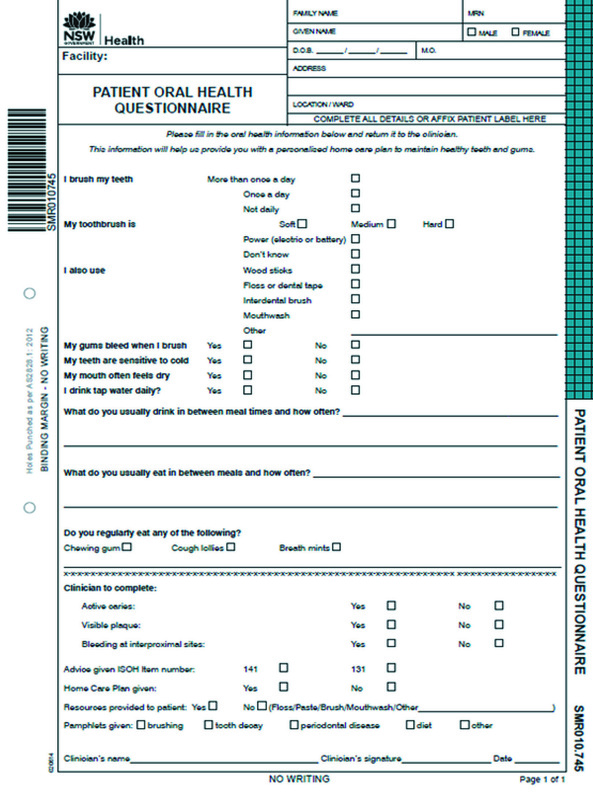 Once active, these forms will be further evaluated for effectiveness in preventive care, with the aim of extending their use to other services. Samples of these forms are shown in Figures 1 and 2. 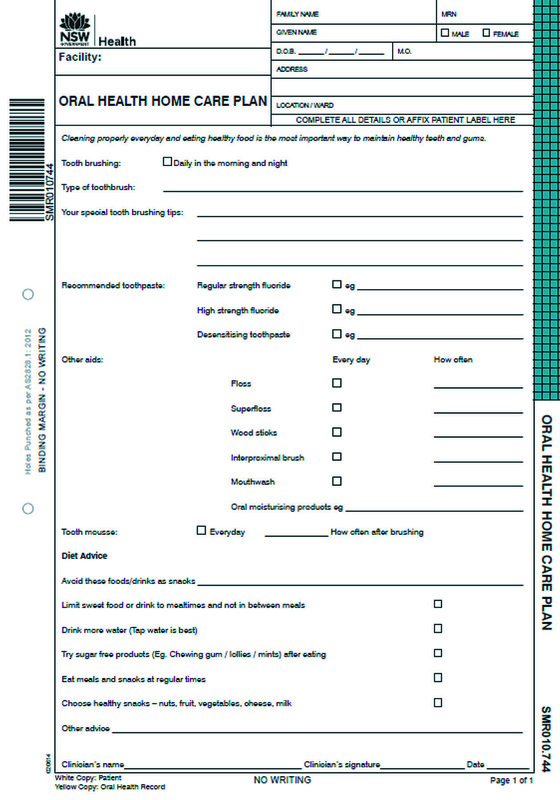 Diet questionnaire used for the Chairside Advice Project. Patient home care plan with diet recommendations. The Specialist Pediatric Dentistry Department at the Sydney Dental Hospital sees large numbers of very young children suffering from early dental disease. It was clear that, in addition to surgical intervention, preventive approaches were required for better management of these patients. The Pathway to Oral Health was established to provide families with education and preventive care to complement and support dental treatment. The dietitian and oral health therapist are integral in managing this aspect of care, while the pediatric dentists coordinate appropriate dental treatment. The outcome has meant that families are better equipped to prevent a continuation of caries, to reduce the need for further treatment, and to increase the chance for a healthy dental future. The parental role and a family-centered approach are emphasized. During the diet consultation, social and cultural factors, health issues, and lifestyle are all considered, and parents are encouraged to engage in positive discussions about what healthy eating habits and changes may be effective within the family. Dietary sugar has become more newsworthy than dietary fat consumption, and messages about reducing total daily sugar intake and processed carbohydrates now dominate current nutrition headlines. Recently, an article in the Sydney Morning Herald titled “We Need a War on Second Hand Sugar” puts early and involuntary exposure to sugar and other sweeteners in the same category as passive smoking. 8http://www.smh.com.au/lifestyle/health-and-wellbeing/nutrition/we-need-a-war-on-secondhand-sugar-20170129-gu15mt.html. The article cited a report from the Washington Post about new research indicating that early exposure to sugar/sweeteners during pregnancy, infancy, and early childhood may increase the risk of developing adult obesity. 9https://www.washingtonpost.com/opinions/we-need-a-war-on-secondhand-sugars/2017/01/27/1ad09020-d763-11e6-9a36-d296534b31e_story.html? utm_term=.5beaaf8ca032. The World Health Organization advocates that for adults and children, added or free sugars should be reduced to less than 10 percent of total energy intake, and that a reduction to 5 percent would be preferable. The drastic and rising incidence of obesity in many countries and its associated health risks, most notably Type 2 diabetes, underlies these recommendations. Some countries have successfully implemented sugar taxes, while others continue to advocate for these changes. 10https://en.wikipedia.org/wiki/Sugary_drinks_tax. This shift in dietary focus places oral health professionals in a much more critical position for providing good dietary counseling, with the goal of improving oral and general health outcomes. Longer appointment times and the low stress environment of the dietitian’s office facilitate a holistic inclusive approach. Oral health professionals have the chance to make a great impact with respect to improving their patients’ diets. I believe dietary advice that has for decades been included in dental practices as a key part of caries prevention and risk reduction is now closely aligned with the most current nutritional messages advocated for general health promotion and disease prevention. In the words of Aubrey Sheiham, Emeritus Professor of Dental Public Health for the World Health Organization, “The compartmentalization involved in viewing the mouth separately from the rest of the body must cease.” 11http://www.who.int/bulletin/volumes/83/9/644.pdf. Four children under five are referred with severe early childhood caries (S-ECC). All cases are found to be associated with inappropriate bottle feeding habits, including duration of use, type of beverages, frequency, and timing of intake. Food choices were also affected by reduced appetite and preference for snack products. Educate parents about how bottle use and overconsumption of milk affects dental health, appetite, and food intake. Suggest strategies to stop bottle drinking. Establish meal routines and healthier food choices. Female, 46 years of age, with severe dental erosion associated with high fruit intake. She told of being raised in a family in which fruit was the only food permitted to eat between meals. It was usual for her to consume 6 to 8 fruits daily, but during her pregnancy her cravings increased. She could eat as many as seven oranges at breakfast, and more throughout the day and night. Other siblings had also experienced varying degrees of dental erosion associated with a similar fruit habit. Educate patient about impact of acidic foods/drinks on oral health, and demonstrate how to minimize the effect of these items. Female, 95 years of age, who presented in good health and with most of her natural dentition. Her main complaint was associated with a very dry mouth at night. Her general diet was good, including a variety of fruits and vegetables daily. A careful history revealed that, in an attempt to reduce night time toilet visits, she consciously minimized fluid intake and was consuming only a few cups of coffee each day. Educate patient on the importance of hydration for health, how dry mouth can increase caries risk, and on the dehydrating aspects of caffeine. Demonstrate ways to include sufficient fluid intake throughout the day. Male, 33 years old, with rampant caries. Almost all of his teeth were affected, and extensive treatment, including partial upper and lower dentures, was needed to restore chewing function. He believed the tooth damage was associated with alcohol and cigarettes. Despite lowering his alcohol intake he was still consuming significantly above health recommendations and his smoking habits included 1 to 1.5 packs a day. A diet history revealed that his intake of added sugar was excessive and included 5 to 8 cups of sugared coffee a day. Following his dental extractions, when hot drinks were not permitted, he replaced this with 2 to 3 liters of a cola drink. Educate patient about the role of sugar in dental caries, the ongoing risks associated with hot sugary beverages, and modifications to lower these risks. Suggest moderate dietary changes to minimize further harm. 1.Shah K,Hunter ML, Fairchild RM,Morgan MZ. A comparison of the nutritional knowledge of dental, dietetic and nutrition students. Br Dent J 2011;210:33-8. 2.Position of the American Dietetic Association: Oral Health Nutr 2007;107(8): 1418-28. 3.Touger-Decker R, Mobley C, et al. In: Nutrition and Oral Medicine, R Touger- Decker, DA Sirois, C. Mobley, eds. Humana Press, Upper Saddle River, NJ, p. 376, 2014. 4.Rugg-Gunn AJ, Nunn J. Nutrition, Diet & Oral Health. Oxford University Press, 1999. 5.Palmer CA. In: Diet and Nutrition in Oral Health 2nd Ed. Pearson Education, Inc., Upper Saddle River, NJ. 6.Young WG. The oral medicine of tooth wear. Aust Dent J 2001;46(4):236-50. 7.Young WG. Teeth Edge Erosion: Watch your Lifestyle; Case Studies and Treatment Plans for Patients facing Dental Erosion and Tooth Wear Erosion. Watch Pty Ltd 2003.